Looking to change up Taco Tuesday? 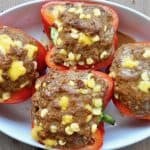 Need a Low Carb Stuffed Pepper recipe?? Make these Taco Stuffed Peppers for a fun alternative to a regular taco with a tortilla. Or maybe you’ve been missing out on Taco Tuesday because you’re carb free or low carb? You’ve got to try these Taco Stuffed Peppers. I mean seriously they are amazing. Everything for a TACO stuffed in a mild sweet red pepper. You can make these ahead too and cook in an Instant Pot or Slow Cooker. Perfect for anyone whether you’re going low carb or just need a change from your normal Taco Tuesday repertoire. Low Carb Taco Tuesday Change Up! Sometimes you need a break from the tortilla, maybe you do, but I bet your kids don’t. These Taco Stuffed Peppers make a great alternative at least for parents on Taco Tuesday. Now I dearly LOVE to make my own Low Carb Tortillas but sometimes you need a change and these peppers are there for you. I’d definitely make these when peppers are on sale. Right now they up around 2.50 a pepper but sometimes I can get them for around a dollar. You’ve got to love produce in Alaska, right?? Or maybe you CAN eat tortillas but you’re just kind of done with the whole thing. Yes, kids LOVE Taco Tuesday, but YOU need a change of pace. These taco peppers are the change you’ve been looking for. My kids took one look at these and begged me with their eyes for regular tacos. They eat peppers just fine but the idea of stuffed pepper on Taco Tuesday was a big fat no. I understand that. I can respect that. I’d made them regular tacos as well. 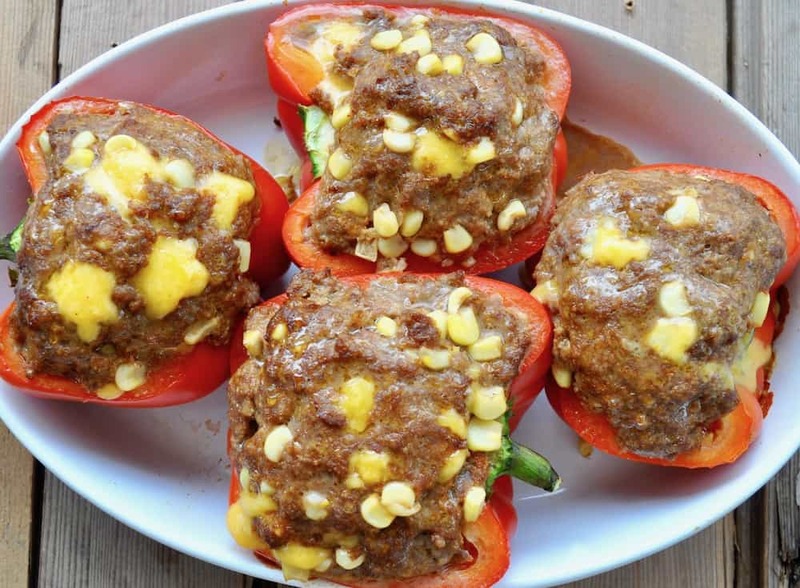 Make these low carb stuffed peppers ahead of time and save yourself some hassle in the kitchen. Prep them in the morning and pop them in a baking dish, refrigerate until ready to bake and then slide them right in the oven while you make a salad and set the table. You can also make Taco Stuffed Peppers and cook them in the slow cooker or the Instant Pot if you need to. I’ve included approximate cooking times in the recipe but remember machines vary and so can cooking times. Just a little warning I like to give people so they KNOW in advance. Looking to change up Taco Tuesday? Make these Taco Stuffed Peppers for a fun alternative to regular taco with a tortilla. Or maybe you've been missing out on Taco Tuesday because you're carb free or low carb? You've got to try these Taco Stuffed Peppers. 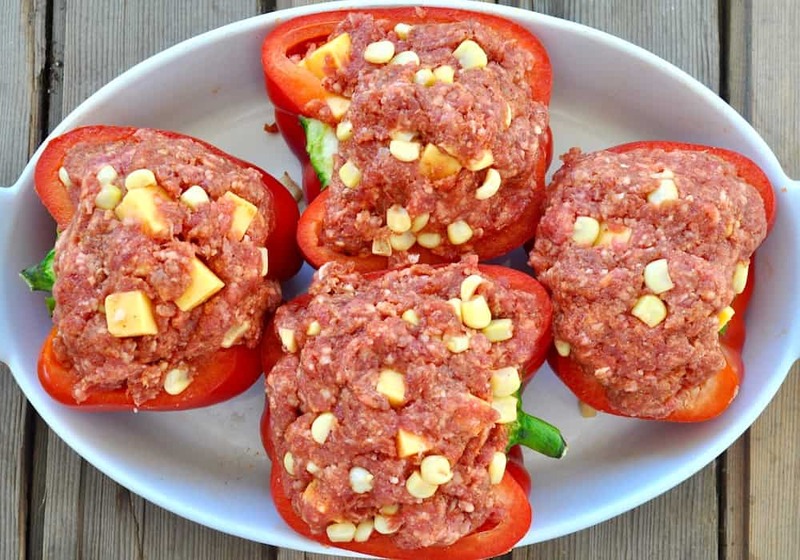 My husband has been wanting some stuffed peppers and these look like a great version to try! We love taco inspired anything so they are sure to be a hit! I have a bag of peppers just waiting to make this for my meals this week- I think I will change it up and make them taco-style like this- great idea! These are a terrific idea! I’ve made chorizo & rice ones similar to this idea, but I like the straight-up taco flavors. They look delicious, too. Yum! We love stuffed peppers! These look great, Laura!